The Omaha tribe began as a larger woodland tribe comprised of both the Omaha and Quapaw. The original tribe inhabited the area near the Ohio and Wabash rivers, near present-day Cincinnati, Ohio. As the tribe migrated west it split into what became the Omaha tribe and the Quapaw tribes. 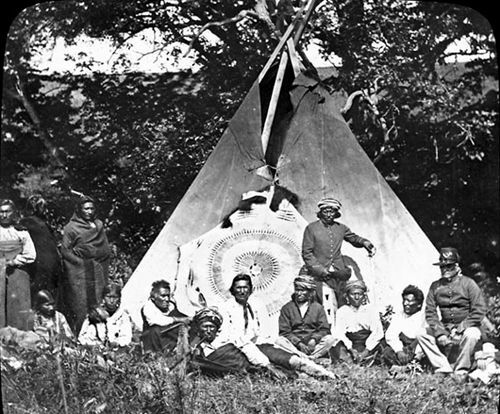 The Quapaw settled in what is now Arkansas and the Omaha tribe, known as “those going against the wind or current” settled near the Missouri River in what is now northwestern Iowa. Conflict with the Sioux and the splitting off of part of the tribe into the Ponca forced the Omaha tribe to retreat to an area around Bow Creek, Nebraska. Their territory extended from near Yankton, South Dakota, south to Rulo, Nebraska, and up to 150 miles west, an area of 35,600,000 acres. They had villages at Homer and Bellevue, Nebraska and probably several other locations up and down the river. Every eight to fifteen years they moved their village of 50-100 lodges to clean ground and new hunting areas. In the beginning, it was their custom to build bark lodges; however, this was replaced with the idea of teepees borrowed from the Sioux and earthen lodges borrowed from their allies, the Pawnee. The tribe usually wore breech-cloths, buckskin dress, and moccasins. The men wore their hair in a scalp-lock, usually having the rest of the hair braided and hanging down on each side of their head. Polygamy was practiced, but the maximum number of wives that any one man could have was three. They are also the originators of the picturesque Omaha dance which soon became common to most of the plains tribes. The Omaha were thriving as hunters and farmers when they first encountered white fur traders around 1750 in the Bellevue area. Buffalo served as their primary provision, providing food, clothing, blankets, rope, moccasins, fuel, shelter, and utensils. To supplement their diet, the Omaha also planted gardens containing, corn, beans, squash, and melons. In 1780, the Omaha tribe had almost 3,000 members but by 1802 they had declined to a mere 300 due to sickness and warfare. The Omaha were settled in what is now Dakota County, Nebraska when Lewis and Clark came upon them in 1804. The Omaha lived under the protection of the powerful Pawnee, who claimed the whole Platte region. Since they occupied a subordinate position, the Omaha have never been as prominent in tribal history. As the buffalo disappeared from the plains the Omaha had to increasingly rely upon the U.S. government and its new culture. 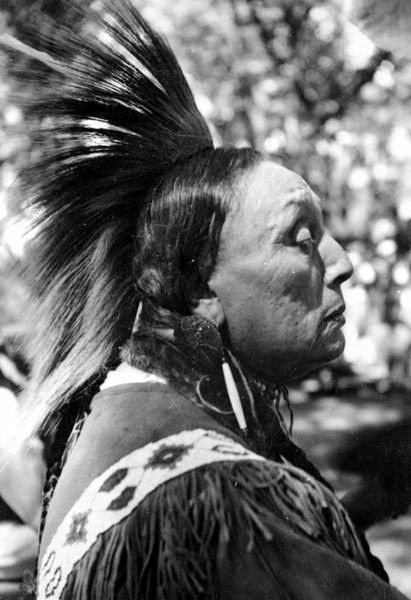 They joined with other tribes in treaties with the U.S. Government in 1830 and 1836. The treaty of March 16, 1854, ceded all their lands west of the Missouri River and south of a line running due west from the point where Iowa river leaves the bluffs, retaining their lands north of this line for a reservation. More than ten years later, in another treaty on March 6, 1865, they sold part of their reservation to the United States for the use of the Winnebago Indians. 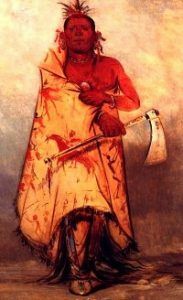 The last full-blooded Omaha Chief was Big Elk who died in 1846 and is buried in Bellevue Cemetery in Bellevue, Nebraska. Today, the tribe has about 5,000 members with approximately 3,000 residing on the Omaha Reservation at Macy, Nebraska. I am bothered by your description of the buffalo as “disappeared” rather than slaughtered by non-Indians as well as “the Omaha had to increasingly rely upon the U.S. government and its new culture.” The land ceded to the US were hunting grounds and the supplies from the government were part of the payment for those resource rich lands many of those supplies were sold by the Omaha agent for personal gain leaving the Omaha in dire positions. As a scholar of Indigenous Studies, I would encourage you to research more thoroughly especially The two volume series, The Omaha Tribe, by Alice C. Fletcher and Francis La Flesche. clear of where he was buried except that he made it back to his people 4 miles east.